Click To Shop Today's Deal.Low Pricesand new deals every day. A miter saw is a tool that has been specifically made to easily cut of different shapes. It has a sharp blade that moves from side to side to make a cut on whatever shape one wants. Examples of cuts that a miter saw can make cutting timber, doors or windows that open by sliding horizontally. Although there might be other types of cutting saw, a miter saw is the best because it brings out almost exact crosscuts whenever it’s used to produce an angle cut. Standard miter saw can cut the board from the top at an angle. This allows you to easily create corner pieces for a variety of projects. Compound miter saw allows you to cut your piece at different angles, both horizontally and vertically. Single-action compound miter saw bevel only to one side, while dual-action saws bevel to both sides for greater versatility. A miter saw can sometimes be challenging for a new user who has no idea on how to lock or unlock. The saw is mobile in that the carpenter can move with it easily for convenience when working. The miter saw has double locks that make it accurate and safe you are using it. It has a back lock and front lock, a front lock helps in controlling the angles of the cuts the carpenter makes while the back one helps the movement of the blade up and down. Whenever you are moving the blade on the lower side to make it safe or also when it’s not in use, the lower part of the plate is pushed down the table the blade rotates at the back where it makes it locked. Unlocking a miter saw is not a complicated process. The locks in the miter saw are controlled by one knob and also have a pin. 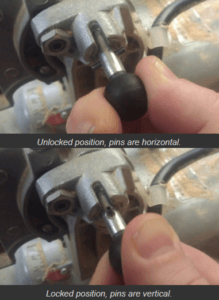 The knob at the end point of the pin are used unlock the miter saw. You can either pull or push the knob to adjust the locks. There are different types of miter saws and depending on the type, you will know whether to twist the knobs or not so as to unlock the miter saw or lock it. Most cases when using a miter saw, when locking and unlocking the blade, one has to either push or pull the blade lock knob. The blade will immediately come up when the pin has been released the blade. A miter saw’s upper part of the blade is covered by a guard hence you can open it at any place. If it is not protected with a guard when it lifts, it shows the guard is dirty and needs cleaning to ensure there is an easy movement of the blade. The double locks on the front side of the saw control the angles. A knob and a lever on the miter saw may sometimes be placed next to each other depending on the type of the saw although this does not affect or change their roles during operation. Both the knob and lever work simultaneously so as to lock at different standards. So, if you want to unlock the miter saw, you need to loosen the knob and when the knob is tight it mean that the miter saw is locked. You can also decide to release a set in advance angle lock by making the lever inadequate using either the index or middle finger. This process requires mild force so as to achieve required standards because the lever has springs in it. Not all miter saws can do beveling role because maybe the angle locks are not consistent between each other. So, when a miter saw has no features of beveling them, usually use a pin or a lever loaded with springs to ensure that the bevel is always locked. You either have to operate the pins on the locks or hold down the lever by pressing it and when it reaches an angle of your desire one can release the lever. The commonly used angles for bevels have a lot of preset lock stops but one can escape all these processes. For example, when the bevel has reached the angle you want one can release the lock’s mechanism. Swivel is a connection that allows objects connected to either rotate vertically or horizontally, for example, a cylindrical rod. Many angles lock set in advance are inbuilt in the saw. The micro levers are for locking in various miter cuts angle and ensuring that the transportation angle is fine while the macro knobs remove the blades so as the carpenter can easily move or use the miter saw. When one depresses the lever and then rotates it to an advance and it becomes adjusted. Because many carpenters carry their miter saws to and from job sites, manufacturers have designed the saw to be safe and easy to transport to various locations. Most saws come with different locks which keep the various pieces in place while it’s being moved and helps keep the saw aligned between uses. Using a miter saw may seem slightly frightening for starters, but they are easy to unlock when the need arises. The locks on the miter saw are very important because they help the carpenter or woodsman to safely move the saw when working. Locking also allows the saw to be in a good working condition for future use. Therefore, it’s very important to be conversant with the locking and unlocking of a miter saw.